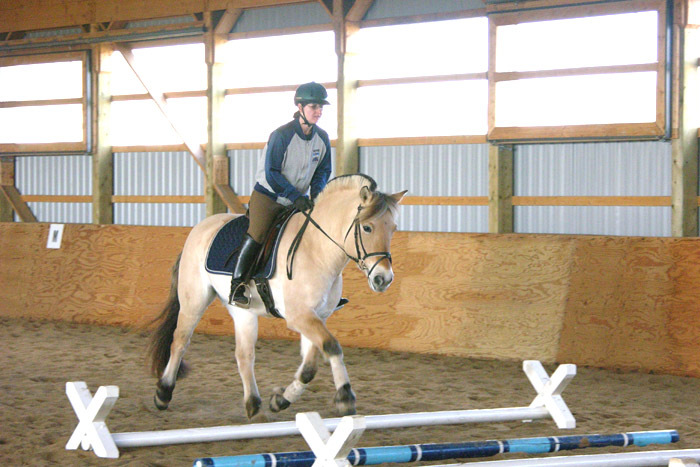 The use of cavalletti in the training program has benefits for all riding horses, whether they are destined for a career in dressage, jumping, eventing, or pleasure riding. 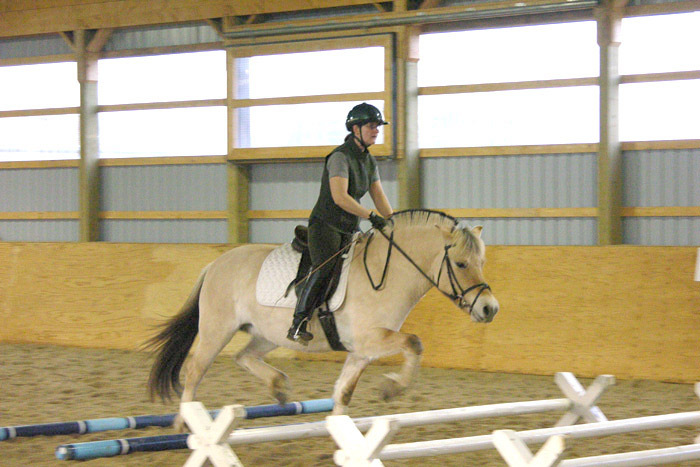 Work over cavalletti can enhance the regularity and rhythm of paces, loosen up and strengthen the muscles, contribute to development of the heart and circulatory systems, increase balance, sure-footedness, and suspension, and develop and test the ability to learn. Best of all — particularly in light of all the other advantages — work over cavalletti is a lot of fun for both horse and rider! 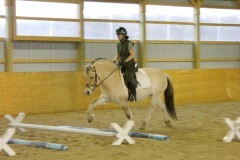 The horse can be worked over cavalletti without a rider (on the lunge), and with the rider, both on straight lines and on circles and half-circles. 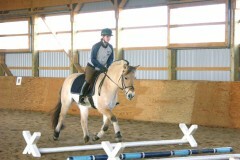 Exercises can be set in walk, trot and canter. 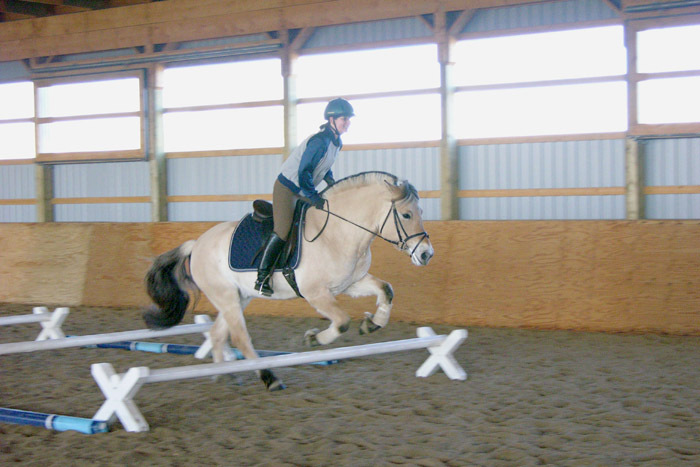 As proficiency increases, more difficult exercises can include lengthening of the strides, leaving out one or more poles, work on collected gaits, and small gymnastic jumping lines. 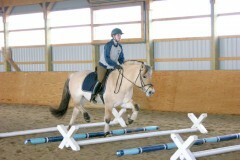 One disadvantage of cavalletti work is that it is best done with a ground-person to set up each successive exercise. If, like me, you usually work on your own, this can be a problem. However, I can generally get someone to help me out on the weekends, and since work over cavalletti should not be overdone, this seems to work out about right. There are other pitfalls, mainly related to the danger of injury from improper spacing or improper equipment or from overdoing the exercises. To avoid these, I recommend reading the book Cavalletti- The Schooling of Horse and Riders over Ground Poles by Ingrid and Reiner Klimke. The Klimkes’ book contains an in-depth discussions of the theoretical and practical considerations. Cavalletti are constructed from poles from 8′ to 11′ long, with supports that allow them to be set at three different heights: 6″-8″ at the lowest setting, 12″-14″ at the medium setting, and 20″ at the top setting. 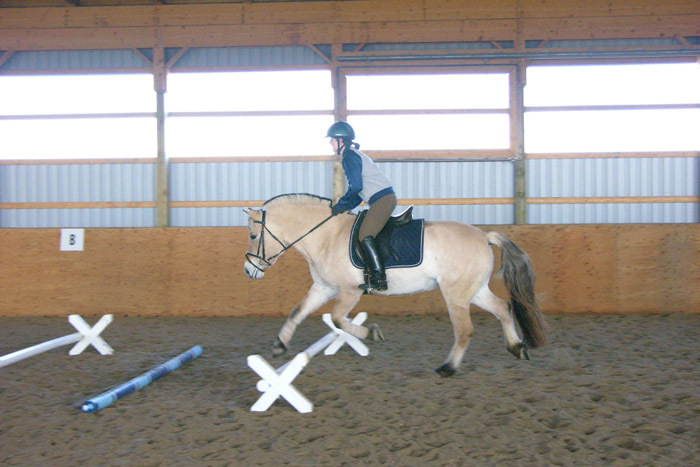 The spacing of the cavalletti will vary depending on the length of the horse’s stride, and may change as his strength and familiarity with the exercises develops. The range for the walk varies from 2’8″ to 3’3″. The range for the trot varies from 4’2″ to 5′. To figure out the spacing for an individual horse, I start with two poles in a row, set at a guesstimate distance within the above mentioned ranges, and have my ground person closely observe how the horse travels through the line. We make adjustments as necessary before adding more poles at the spacing we decide is right. 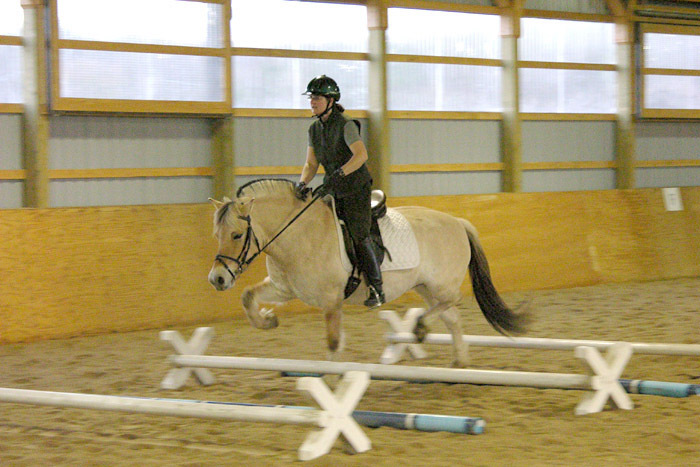 The spacing of cavalletti for canter work is usually about 11′ apart, but could vary from 9′ to 12′ taking into consideration the size and movement of the individual horse. For the canter, the cavalletti should be set on the top height of 20″, so the horse takes it seriously and does a proper jump. At the lower heights the horse can get flat and fast, which is the opposite of what we want. 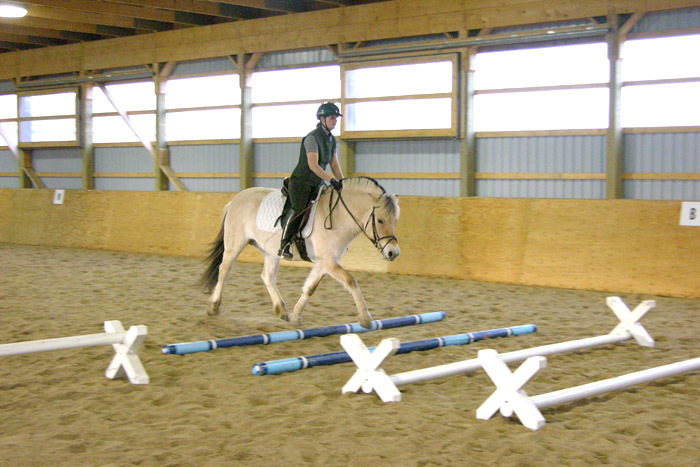 It is preferable to do these exercises with actual cavalletti, the advantage of which versus ground poles is that they won’t roll away if knocked by the horse (which could cause an injury if the horse then stepped on the misplaced pole) and the height of the cavalletti above the ground increases the effort required, and therefore the benefit received. Our farm has only three cavalletti at the present time, so we intersperse the cavalletti with ground poles. This works best with the heavy type of ground poles which won’t roll as easily as light ones if they get knocked. The first four photos show the four year old Fjord horse mare Bluebird Lane Peregrine, and the remaining photos are of the six year old Fjord horse mare Bluebird Lane Sparrow, both ridden by Lori. Notice how the younger horse, who is just learning the exercises, lifts her feet way up, making sure to give the cavalletti plenty of room. 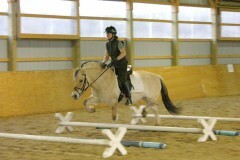 The horse who is familiar with this work lifts her feet just as high as needed for each exercise. You can see from the photos how this type of work will benefit the horse in terms of developing muscular strength, but don’t overdo it – in either length or frequency – and risk strains. 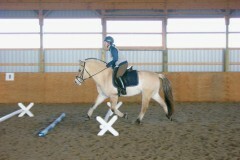 Four year old Fjord horse, Peregrine, learning to trot through cavalletti on lowest setting. Here we raise the cavalletti once she gets the idea. Note flexion of knees and hocks in this and following photo. 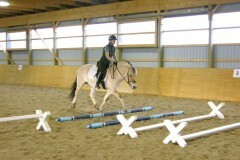 Cavalletti on middle setting interspersed with poles. Rider is working to maintain straightness. Fjord horse with pricked ears and an expressive entry in a more rounded outline. 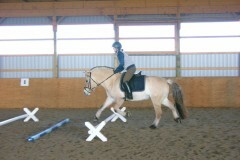 Six year old Fjord horse, Sparrow, starting out with cavalletti on lowest setting. Horse making her own way straight through the line. 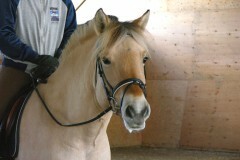 Cavalletti raised to middle setting, note the keen expression of the horse. Another example of pricked ears and total focus. 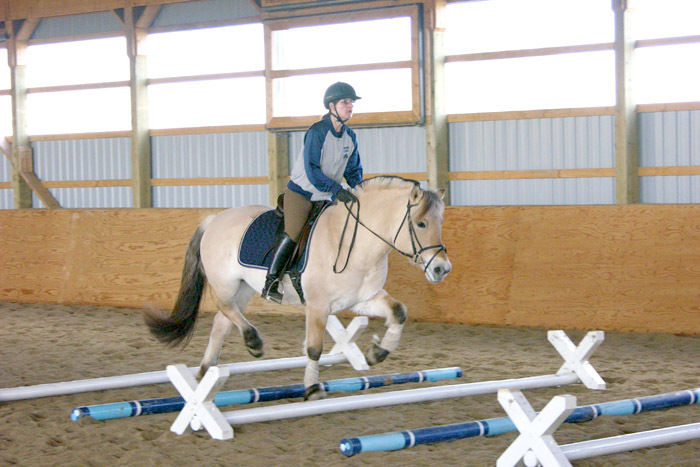 Three cavalletti on the top height, set one canter stride apart from each other, can help improve the springiness of the canter. This was helpful, especially the part about the distance between cavelletti and the methods you use to determine the distance. Thanks!! Ginny that is wonderful! Thanks for sharing that. It’s so true, our horses keep us going and keep us young. I wanted to comment on your question, although you should also check with a professional trainer in this discipline. I am newer to Tennessee Walkers, and acquired an 19-year-old last Spring, so we are working with him in English saddle now. However, I have an off-track Thoroughbred who has UFP on the RH, so I have been working with that for over five years now, with great success. I can certainly give you some general advice that will help and recommend that you look at Stephanie’s site (I’ll give you the address at the end), a professional therapist who trained in German schools and now works from her Wisconsin farm, while also traveling and giving clinics. 1. Regular/consistent exercise is important, but not the wrong exercise. 2. Past trainers used to ignore the issue and work the horse as they would work one without this issue; it caused further problems. 3. Trot work and work up and down hills is the BEST work (in your case, a slower running walk) for stifle issues. 4. Jog and canter work is harder on horses with stifle problems so should be limited and only done at the end of a session or ride for short periods. The horse should be fully warmed up and relaxed before any light canter work. 6. Think of the stifle as part of the a locomotive train: it needs to be moving and well-oiled! Standing in stalls for long periods is also detrimental to this issue. 7. If you can’t give your horse 24/7 turnout, (ours are out for about 16 hours a day, which is good), then try to take him out in the middle of the stalled period, so that he doesn’t stand in his stall for many hours. 8. Therapeutic massage is excellent too; you can learn the proper method from a therapist or consult a good book on the subject. There are specific exercises that can help stifle issues. 9. Don’t underestimate the benefits of just walking your horse — it’s excellent for his physical and mental health. 10. Try to keep riding or training sessions short — ideally 30-35 minutes, and never put your horse right back into the stall after heavy exercise, without giving him a sufficient cool down walk — at least 10-15 minutes. With stifle issues, you need to think: Keep him moving, keep it active but gentle, no tight circles (minimum 30 meter) and if you live in a cooler climate, winter cold will cause stiffness, so massage is important during winter weather. Consider the health of your horse’s back when riding and ensure tack fits perfectly. It’s much better to ride for 20-35 minutes, five days a week, than to ride for one hour two or three days a week. Depending upon your schedule, try to have short rides more often. Try going bitless, too, if you can. We ride our Tennessee Walker in a Dr. Cook’s bitless bridle (they have English and Western designs). He was very unhappy in a harsh bit with the prior owners. You do not need a bit to control a horse; I ride my off-track Thoroughbred in a bitless bridle, too. Both horses are much happier bitless, they can breathe normally and therefore they are more forward going but calmer. 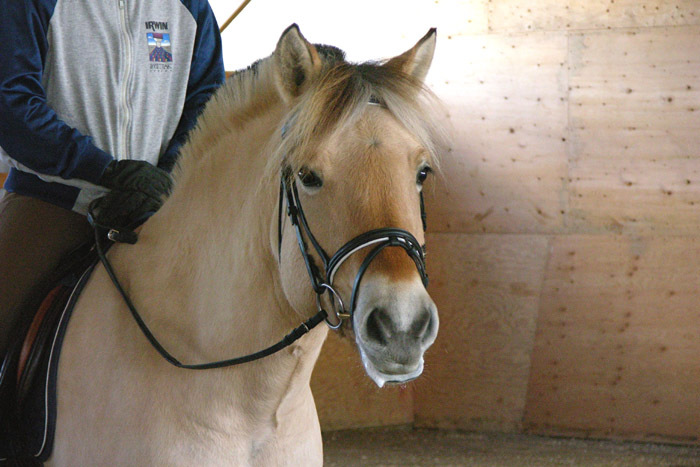 The bitless bridle gently hugs and poll, cheekbones and forehead, and is used the same way as a regular bridle when employing an emergency stop, but it does not hurt or cause any discomfort to the horse. 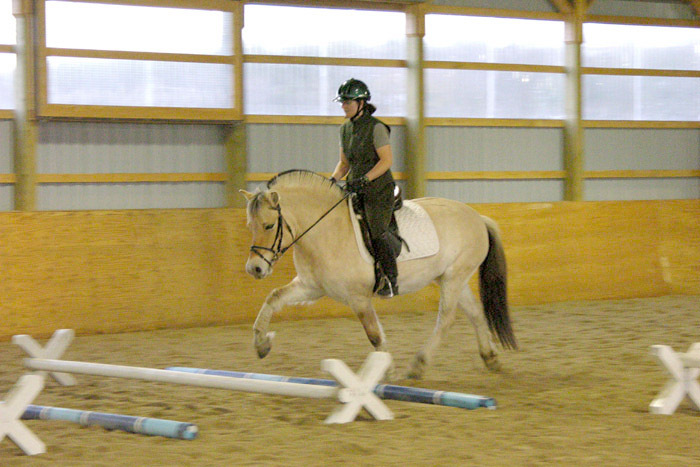 Try one — at first in an enclosed space (arena or roundpen) to see how your horse responds. Look at Dr. Cook’e website to learn more. If you have more serious stifle issues, you should consult your veterinarian in case he or she needs to intervene with light medication, but many stifle issues respond well to the right exercise, trot work, hill work and massage. Since I have been employing the advice of this therapist, Jack’s stifle has not locked once, and I no longer hear the ‘clicks’ I used to hear in his RH. Whereas, the wrong exercise can actually worsen the problem. Consult Stephanie’s website: stephaniereinhart.com. for more information and educate yourself as much as possible on the stifle. Stephanie has a section on her website devoted to stifle issues. Many warm wishes, and I hope you will find this helpful. My OTTB is now nine years old and has been off the track (training him too young and an injury caused his stifle issue) for six years. He’s a happy, healthy, calm horse, and boy can he gallop with the herd when he chooses! Give you horse all the love and affection you can — these are precious days and the two of you are time travelers — remember that! And Cavalletti! 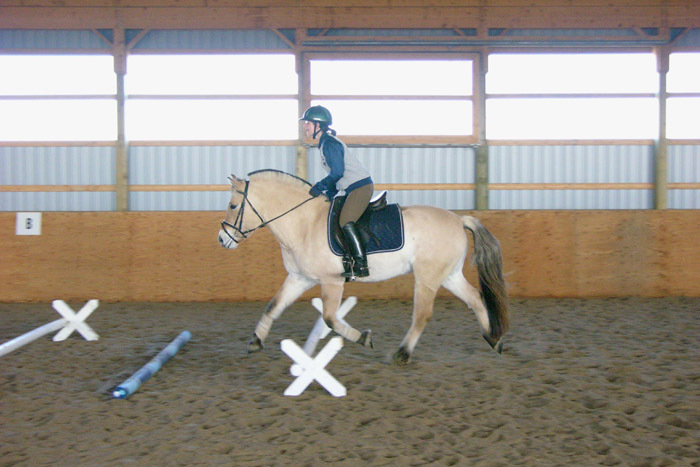 Cavalletti exercises are excellent for stifle issues — just don’t overdo it — as recommended on this site. It’s Stephanie Reinhold (not Reinhart as stated). Her site is excellent, visit when you can. p.s. Let me know how you proceed with your horse.